Life, Risk & Monopoly – What do these words all have in common? 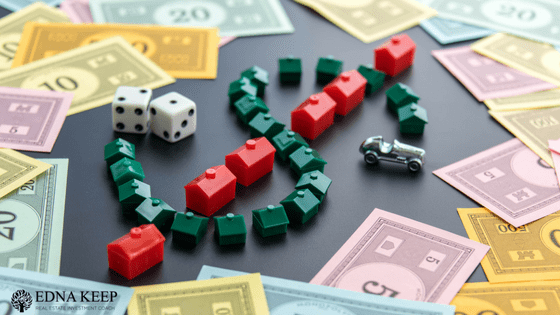 They are some of the beloved board games of our childhoods and also common themes of real life real estate investing. These were the games that we would pull out of the closet for a rainy day or when we gathered in big groups – They were created to not only entertain us, but also educate us. These games were made to help us learn a lesson and strategize. The problem is, some of the lessons learned from these games are dated – yet we still stick to what we learned from them out of sheer habit. The original designs and concepts of this game are well over a century old. Yet, some of these principles remain in our minds. The game of Monopoly has taught so many of us that we must start small and build up from the bottom – The family-fun investment game forces us to buy rows of little green houses until we have accumulated enough value to trade them in for hotels. The game is over 100 years old! In real life, we can actually skip the rows of tiny individual houses and go straight to the little red boxes (the apartments). We can do this because real estate has changed, access to financing, joint ventures, and vendor take-backs have changed. Almost every way in which we can acquire the property has advanced, yet some people are still stuck in the mindset that you must buy one house at a time, pay it off, then buy another. Why would we do that? Because you don’t know what you don’t know. Well, let’s pretend that the game allowed for forced appreciation and joint ventures with another player – That’s where the real value is – That’s the strategy that I follow. I don’t want to spend years gathering the little green houses on baltic that bring me in minimal rents and cost me tons of time and money in management. I want the apartments on the mid-level streets – the apartments that I can acquire with the same amount of an investment, but I can increase their value based on their NOI. We can’t force appreciation on the little green houses — they will always just be worth what the market says they are. Apartments are considered a business – therefore, it’s commercial real estate. The perks that come along with that are endless. If you had the same amount of time and money to invest in real estate, would you rather own a few little green houses on your own, or partner up with someone to have the big red, valuable apartments? I would go with apartments, every time. Would you rather oversee 10 individual houses with varying tenant, repair and maintenance challenges or one 10-unit apartment building that could write off the costs of a property manager and force its appreciation? The term ‘commercial real estate’ tends to intimidate beginner investors, but did you know that commercial deals are considered anything 5 units or more? Tiny apartments are considered a commercial investment – and in my opinion, small apartments are the best way to invest in real estate. The thing about forced appreciation is that it only exists in commercial deals (5 + units), not residential deals (such as houses and 2-4 units). The procedure for analyzing an apartment deal is the same with 5 units or 300 units. It’s all about the financial statements. Banks don’t like to take risks. They look at apartments in a whole different view. An apartment can sustain itself with a few vacancies (usually up to 15% is where you want to stress test it) But a single, residential property investment cannot sustain itself with even one vacancy – that’s a much bigger risk to a bank. Financiers and investors love apartment buildings because the other tenants cover the risk of vacancy. So, I urge you all – new and veteran investors… Throw away what you learned while playing monopoly and learn to build your portfolio from the top down. You don’t need to play small. Go for the red from the beginning – I know you can do it – because I did! Want to know more about why I love apartments? Book a strategy call with me. I teach complete lessons all about small apartment buildings and how to evaluate them, & acquire them. I also have modules dedicated solely to joint ventures and how you can start in this game of life, without risk! I will walk you through, step-by-step, showing you how I went from small-town minimum wage earner to my own multi-million portfolio. Real life real estate Investing isn’t just a monopoly for the big spenders to play – anyone can do it if they have the right information and coaching! Join my Private Facebook group to ask questions and join in the conversation. Interested in learning more about your real estate investment options? 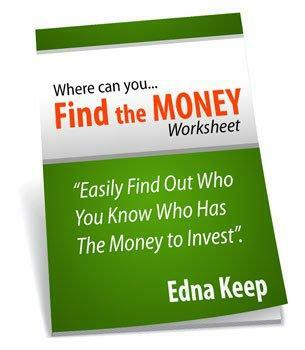 Start with this FREE & Simple Finding The Money Download! Discover the investment dollars all around you! BIG Opportunity: Can You Get A Deal Under Contract With None Of Your Own Money? Join This FREE 5-Day Challenge! The next challenge starts on Monday, May 29th, 2017. Join NOW!